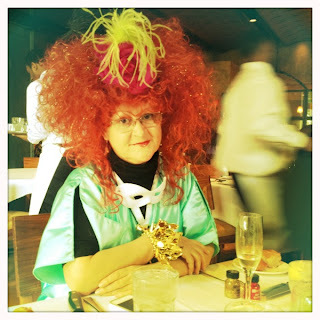 If ever there was a reason for lasik…, I thought to myself as I struggled with my glasses, barely touching my nose over enormous feathered hot pink eyelashes and a mandatory mask, all negotiated around a plunger-like stocking cap and a bouffant Big Bird-yellow Fifi Mahony’s custom-designed wig. 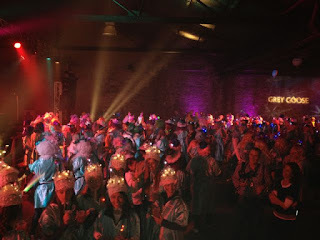 For more than twelve hours my head gathered heat and suspended reality as I posed for pictures, danced and sang with hundreds of costumed Muses, and tossed beads, shoes and blinky trinkets from a papier mache float. It was exhausting, expensive, and, to some, flippantly insane. It was, as my nephews would say, totally awesome. We nap when we can between work, parades and formal balls. We practice yoga and pilates in small, basically ineffectual spurts. 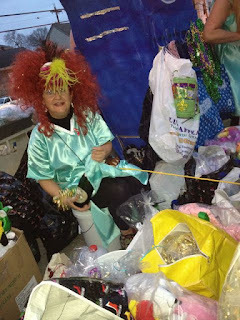 We take mini-rests on the parade route as the floats pause for any number of rumored reasons. And we solicit help from our friends, as we juggle work, family, and other commitments. In my case, my friends loaded my beads (during a thunderstorm, no less) and shared their decorated shoes. 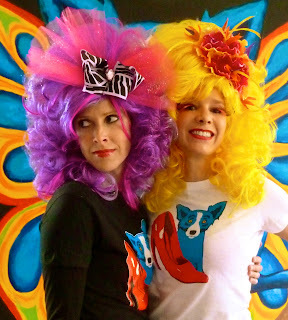 We fluffed each other’s wigs, applied glitter and eye make-up, and monitored the port-o-potty door. Somehow, for a few weeks each year, it all seems terribly important. 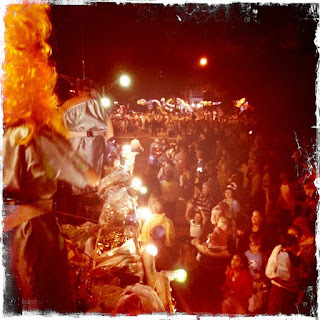 Throw Me Something, Sister!, screamed the crowds last night during the Krewe of Muses all-female parade. “They’re calling your name, Wendy,” said my sister more than once, as we realized the power of social media and the decreasing anonymity of a mask. Perspective and priorities shift at Mardi Gras, as further evidenced by our parade day lunch: four over-dressed ladies forgoing the usual salads (dressing on the side) in favor of Emeril’s Who Dat Burgers with fries. “Extra cheese, please,” said my sister. “More ketchup,” chimed the ladies in chorus. Although I’ve ridden with Muses for years, this was my first time on Float Number One. Unlike the themed floats behind us, we donned our own wigs and made up a few of our own rules. “Always trade a shoe for champagne,” explained Tiffa, as I hesitated at an offer. “But only good champagne,” clarified Pam, as she rejected the sickly sweet pink bubbles. 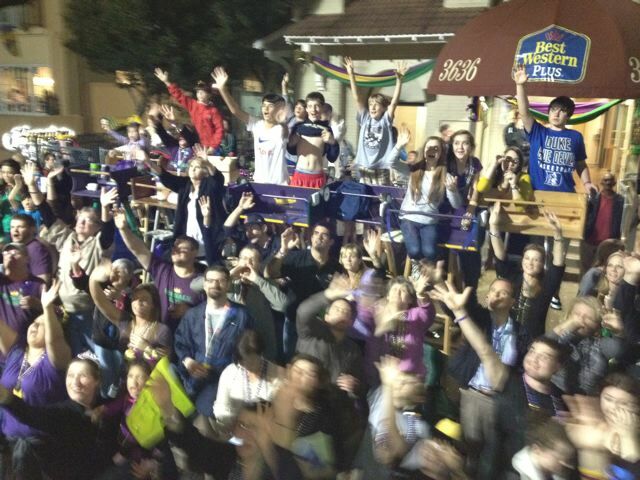 On Float #1, for the first time in a Mardi Gras parade, I felt real pressure to please. 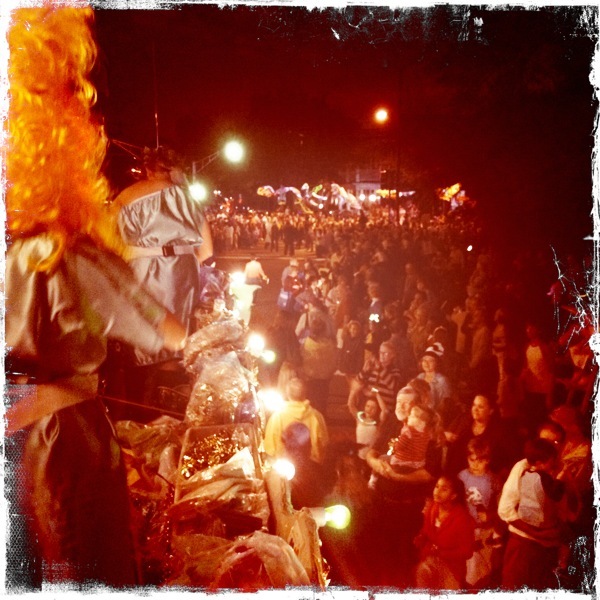 We faced thousands of people, most without adornment, all screaming for shoes and beads and blinky rings. “Pace, Girls!” shouted Tiffa. “There are twenty-five floats behind you!,” as Heather and I attempted to satisfy every child with a stuffed animal and every old lady with a shoe bracelet. 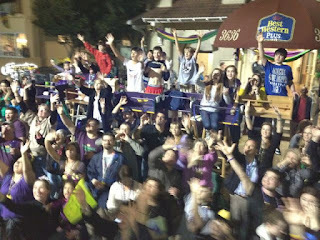 We’re near eye-level with the crowd on this float, as opposed to our usual spot high overhead. “Don’t make eye contact,” warned Tiffa each time the float paused. Also on Float #1, we experienced for the first time the real beauty of the parade. We saw the flambeaux carriers as they lit their enormous torches. We wondered at the giant lighted butterflies. And we danced for six hours on the route to the beat of the O. Perry Walker High School Marching Band, following close behind us. 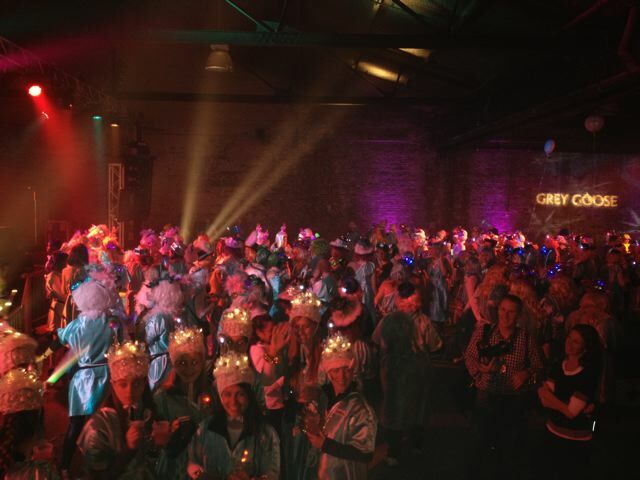 At times we lulled, but our adrenalin (and the hamburger) kicked in, and we marveled at our evening, embracing it full force, amidst historic buildings and magnificent oaks, and the heart of New Orleans – its people. “Vodka and cranberry?” asked Tiffa, forgetting herself as we approached Lee Circle. Looks like it was a blast! Happy Mardi Gras. 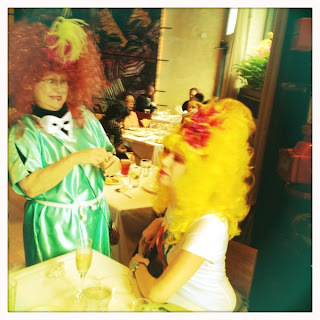 Happy Mardi Gras - thanks for sharing the fun ! Love it!!! 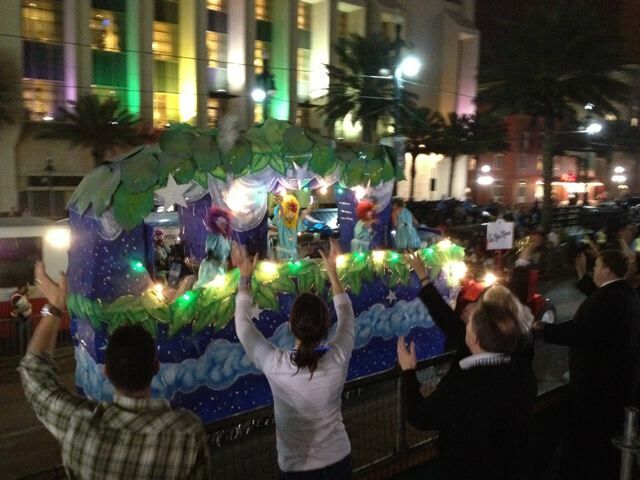 So much fun to ride in a Mardi Gras parade! 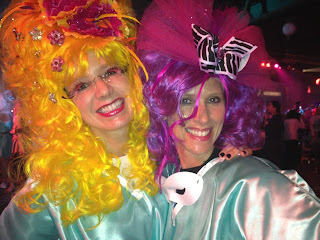 And in a Fifi's wig to boot! We Berry Queens know the value of a great wig!!! Laissez les bon temps roulee!! I was vicariously with you on float #1 and what a bon temps it looked like. 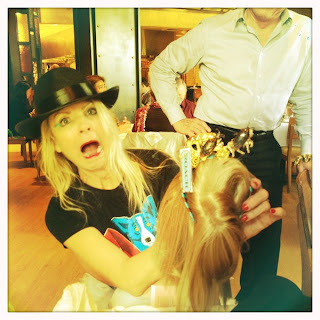 You and Heather looked "wig"ked and the a"muse"ment was never ending. Happy Mardi Gras to you all! !